Gas pedals allow a driver to move a car. However, a defective gas pedal may get stuck and cause an unintended acceleration, resulting in a driver's loss of control. A manufacturer that is aware of a defective gas pedal should issue a recall. However, in some cases, gas pedals get stuck on a floor mat or rise because there is an electrical malfunction of some sort. If you suspect that a defective gas pedal caused your car accident, the auto defect attorneys at Moll Law Group are available to help you secure compensation. Our gas pedal defect lawyers handle litigation throughout the U.S., and billions of dollars have been recovered in cases in which we have been involved. Car manufacturers should provide cars and car parts that are safe for driving. When a defective gas pedal causes or contributes to injuries, it is appropriate to bring a product liability lawsuit. Usually, when a pedal is defective, it has a design defect or a manufacturing defect. Design defects involve a flaw in an intended aspect of the design. They exist in all gas pedals of that design. Manufacturing defects, by contrast, involve a flaw in the process of making a particular gas pedal or batch of gas pedals. In most states, you can seek compensation for manufacturing or design defects under a theory of strict liability. This means you will not have to prove that the manufacturer breached a duty of reasonable care in the design or manufacture of the gas pedals. Instead, you will need to prove that there was a product defect and that the defect caused your injuries. It is easier to establish the right to compensation under a strict liability theory than a negligence theory. However, in some states, you will need to show negligence. Specifically, you will have to prove that the manufacturer owed you a duty of care and breached that duty of care, thereby causing injuries and damages. Some gas pedal defects are not the result of a bad design or a manufacturing error, but instead poor repairs or work by mechanics. In a product liability lawsuit against a manufacturer, your gas pedal defect lawyer will need to show that the car has not been substantially altered since its purchase. If a mechanic has replaced the gas pedal or an associated component, the mechanic may be held liable for any resulting injuries. The lawsuit against the mechanic may proceed on a theory of negligence, which requires that the plaintiff establish the duty of the mechanic, a breach of duty, actual and proximate causation, and actual damages. Compensatory damages are available to a plaintiff who can establish a case against a manufacturer, a mechanic, or another responsible entity in a defective gas pedal case. These damages are intended to put the plaintiff in the position in which he or she would have been had he or she not been injured. They may be economic or noneconomic. In cases of egregious misconduct by the defendants, it may be possible to recover punitive damages. These are rarely awarded, but they may be appropriate in cases in which, for example, a manufacturer knows of a defectively designed gas pedal but fails to issue a recall and warnings to consumers. 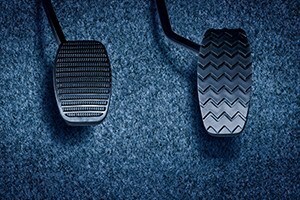 A defective gas pedal can result in catastrophic injuries. If you were injured or a loved one was killed due to a defective gas pedal, the gas pedal defect attorneys at Moll Law Group are available to pursue a claim or sue the manufacturer or other responsible parties on your behalf. We represent injured individuals and their families nationwide, including in states like California, Florida, New York, Texas, Pennsylvania, Ohio, and Michigan. Contact us via our online form or call us at 312-462-1700 to set up a free consultation with a product liability attorney.